Almost as soon as word broke earlier this week that a red panda had gone missing from the National Zoo in Washington, D.C., a legion of unfunny, utterly forgettable parody accounts were spawned on Twitter. Such is the world we now live in. It wasn’t always thus. A long time ago, people sometimes took notice when a parody account was created on Twitter. Parody accounts made the news. 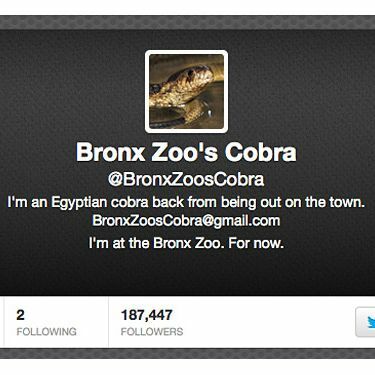 Such was the case with @BronxZoosCobra, one of the more popular and successful Twitter parodies, created in honor of a different zoo escape in 2009. Unlike the ephemeral parody accounts of the present day, however, @BronxZoosCobra is still tweeting. Over e-mail this week, we asked her why. Cobra is hardly surprised at the sorry state of current-events-related Twitter parody accounts. “Comedy is successful when we don’t expect the punch line,” she says. “If everyone is ready for an escaped-red-panda Twitter account, it’s not as much fun.” Cobra is a fan of @SeinfeldToday. Even though Cobra has been able to parlay her Twitter account into writing opportunities, like the gig she has blogging for Pawnation, we wondered if she’s ever considered, you know, stopping. After all, the incident the account is based on happened over two years ago now, and the account’s followers have been steadily declining from a high of 242,000 to today’s (admittedly still impressive) 187,446. “Why would I stop with over 180,000 followers?” Cobra asks. Referring to yours truly, she adds, “It’s not like I have less than 6,000 followers like some people on Twitter.” She punctuates this light jab with :)=, a snake smiley face.